Automatic Control - provides a single, permanent, pre-specified flow rate. Electronic Control - continuous, modulating flow control with 4-20 mA electric ball valve & characterized ball. Limit Control - adjustable "stop" limits maximum flow rate in on/off valves. 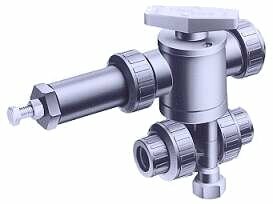 Manual Control - change flow rate with manual ball valve & characterized ball. Pneumatic Control - continuous, modulating flow control with air loaded regulator, transducer, controller, and E/P converter. The descriptions below will help you determine the valving method most appropriate for your application. If you have any questions, please call our technical group at 973-256-3000. 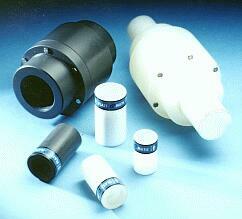 Plast-O-Matic Series FC is an automatic valve that delivers flow at a single, constant, pre-specified rate of flow. This is an unpowered valve that uses a rubber piece acting against a specially cut orifice to provide the pre-selected flow rate. The unique design enables it to remain accurate to within 15% of this flow rate even as line pressure fluctuates. Requires 15 PSI pressure drop across the orifice to maintain accuracy. Advantage: compact, tamper-proof, and an economical way to assure a specific flow rate. Maintain constant flow with inlet pressure changes from 15 to 120 PSI(1 bar to 8 bar). Standard flow ranges from 1/4 GPM (see note) to 120 GPM (1.0 l/m -454.2 l/m). Economical Valve, automatic in operation - no adjustments. Compact design; valve is barely larger than the pipe diameter. For more information on Series FC, please click here. 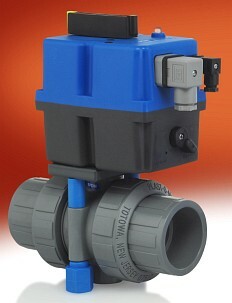 Plast-O-Matic Series EBVA with 4-20 mA or 0-10 VDC control is a modulating 100% duty-cycle electrically powered Ball Valve Actuator. It is based on our standard EBVA actuator, ordered with modulating option and characterized ball design in the valve. The ball can be ordered with a standard V-shape, a Patent-Pending "Batwing" shape for linear flow performance, or with custom-cut ball to meet a specific requirement. Advantage: Simplest way to control every aspect of flow rate with best accuracy. Instantaneous, extremely accurate, continuous flow control. 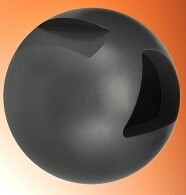 Characterized ball can be specified to virtually any desired flow parameters. Flow rate can be changed as often as desired. Available with 4-20mA or 0-10 VDC control. Uses superior quality True Blue ball valve. For more information on Series EBVA, please click here. For information specifically on the Series ZC Characterized Ball options, please click here. A Limit Stop is a stainless steel screw (non-wetted) added to a compressed air-powered actuator to limit the travel of the actuator, thereby limiting the maximum flow rate of the valve. It can be added to virtually any air-powered on/off valve, including Plast-O-Matic air actuated ball valves, and premium heavy-duty shut-off valves. Advantage: If the only aspect of "control" required is a pre-set maximum flow rate, the Limit Stop is the most economical way to accomplish this. Maximum flow rate can be set with a common wrench. Infinitely adjustable from no flow to full flow. Maximum flow rate can be changed as often as desired. Available with premium heavy-duty shut-off valves or True Blue ball valves. For more information on air-actuated ball valves with limit stops, please click here. For information on premium shut-off valves, please click here. Characterized Manual Ball Valves provide the "hands-on" operator with virtually unlimited manual throttling. The ball is available with a number of standard angle cuts, the patent-pending "Batwing" cut for linear control, and custom patterns for unique applications. Available in a variety of sizes and materials, the Series EBVA actuator with 4-20 mA can be added in the field if you want to upgrade to electronic control. Advantage: Inexpensive option that permits on-the-fly changes, requires no technical skills. Available with a variety of flow curve configurations. 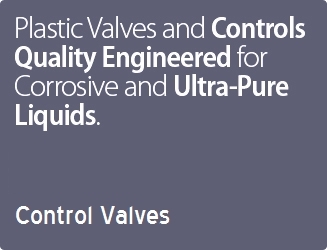 For more information on manual ball valves with characterized ball, please click here. For information on the superior construction of the True Blue ball valve, please click here. Plast-O-Matic Series PRA with transducer, PID controller, and I/P or E/P converter. This is a rolling diaphragm valve -- normally a pressure regulator. It can function as a control valve for a number of liquid variables, when used with appropriate ancillary devices. Requires compressed air supply. Advantage: Versatility and accuracy make it well suited to lab use. Can control flow at remote points. Valve can be adapted to control other aspects of a piping system, such as temperature, pH, viscosity, pressure, etc. For more information on Series PRA, please click here.